If we can invent the term “transcendental rock”, then let’s apply it to Darsombra, Brian Daniloski and Ann Everton’s audiovisual music project. Daniloski, a veteran of heavier, sludgier, grittier rock bands such as Meatjack and Trephine, controls the sound of Darsombra, alternating between mammoth vocal swells and soundscapes and searing guitar riffs, leads, loops, and samples. 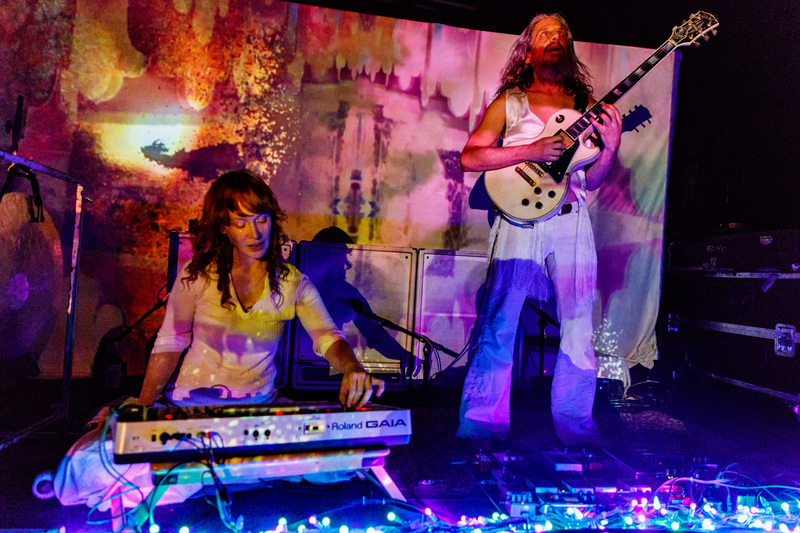 Take one part metal, one part psychedelic rock, one part experimental, and a dash of prog and krautrock, and you begin to have an idea why Darsombra, as music, needs its own genre. But there is more than just Daniloski’s sonic world at play here–video artist Everton takes his work to the next level by bringing her Darsombra-induced visions to the stage through her kinetic psychotropic video projections, creating an constantly shifting backdrop to Daniloski’s live performances. Relentlessly DIY touring for over a decade, Darsombra has touched down on both sides of the Atlantic and Pacific Ocean at music venues, dive bars, house shows, galleries, festivals, yoga studios, city ruins, and storage units, as well as their legendary pop-up generator shows at national monuments or just on the side of the road.